DAVAO CITY, Philippines — Top government officials attended the celebration of the Communist Party of the Philippines’ 48th anniversary here on Monday, Dec. 26. Among the visitors were GRP peace panel chief negotiator Silvestre Bello III and Department of Interior and Local Government Secretary Ismael “Mike” Sueno. Bello congratulated the CPP for their anniversary. “We hope on this occasion, maipaliwanag nila yung proseso na nangyayari between the government and the NDF para sa ganun ay magkakaroon ng suporta dito sa peace negotiations,” he told reporters in an interview. He said they want to encourage the “bigger table” to be active in the peace negotiations, adding that they do not want a similar thing which happened in Colombia where the people rejected the peace deal. “It’s supposed to be a peace forum. Hopefully to encourage the bigger table, because ours is a smaller table. The bigger table is where we explain to the people what is the value of the peace negotiations, that’s why we are here,” Bello said. “So this early we want to explain to the people the process, what we talked about, what we have agreed upon, what will be its final outcome,” he added. Progressive leaders appointed to Cabinet positions and Makabayan bloc representatives were also present. Those who were present include National Anti-Poverty Commission Secretary Liza Maza, Agrarian Reform Secretary Rafael Mariano, Labor Undersecretary Joel Maglungsod, Social Welfare and Development Undersecretary Mae Fe Templa, Bayan Muna Partylist Rep. Carlos Zarate and Anakpawis Partylist Rep. Ariel Casilao. Around 8 a.m. Monday, throngs of people gathered in an open farm field in the guerrilla zone in Barangay Lumiad, Paquibato district here eager to see the tactical formation of the Pulang Bagani Battalion. The parade of colors started, followed by the six platoons from the New People’s Army Pulang Bagani Company consisting of 155 armed rebels. NPA amazons carried the flags of various underground revolutionary organizations affiliated with the National Democratic Front of the Philippines in front of the formation. After the formation, a program followed inside the barangay gymnasium where a large emblem of the CPP dominated the stage. This is very good of Secretary Bello !!! Promoting peace and understanding is the way forward !!! 62,000,000 people murdered in the 20th century by the Soviet Union, symbolized by the hammer and sickle. 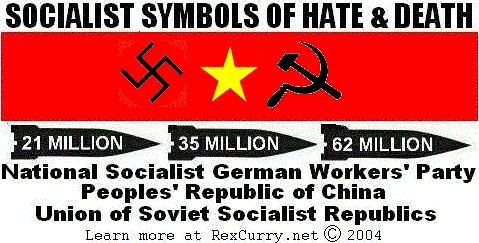 35,000,000 people murdered in the 20th century by the Communist Chinese, symbolized by the yellow star in a red field. Don’t swallow western imperialist propaganda !!! I used to do the same !!! It is a disgrace that any government official from the Philippines would appear on a stage in front of the hammer and sickle, a symbol that directly represents the death and imprisonment of millions of its own citizens in the 20th century. It has NOTHING to do with peace. Shame. 100,000,000 million Soviet citizens murdered ??? If that was true then the Nazis didn’t need to invade the USSR during WW2. They would have just walked over an empty land !!! The fact is that the USSR mobilized more than 20 million soldiers during WW2 !!! No need to repeat your stupid and false data !! !